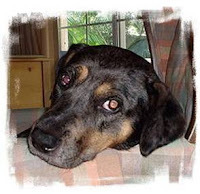 When my noble Akita, Nikki, went to the Rainbow Bridge at age fifteen in 2003, my Catahoula Leopard Dog, Belle, became an only dog. After several months of mourning, it felt like the right time to get another canine friend and companion. I decided on a shelter dog. With my boyfriend, I visited the local greyhound rescue facility but a gentle hound seemed the wrong choice for big boisterous Belle. So, I checked out the Animal Control facility where I'd adopted Belle six years before. None of the dogs that day seemed a good fit. At home, I scanned dogs online at the local Humane Society and came across a picture of a very sad looking dog labeled a Rottweiler/Catahoula mix. Her haunted eyes seemed to say she'd given up on hope. I called the number listed and a kennel worker said, “Oh please come see her. She's been here way too long!” So, my boyfriend and I made the trip to the place Abby no doubt considered both her prison and refuge. A kennel worker brought her outside to a fenced in area where we could get acquainted. Abby pressed her overly thin body against the gate and refused to look at us. She turned her head away from a treat. She concentrated on being invisible. “She's too damaged,” I thought, hardening my heart. After the woman returned the pitiful dog to her kennel I asked some questions about the dog's condition. The answers weren't good. She'd been there five months. In that time, a pattern of management mistakes and bad luck was revealed. She was stressed and thin because she'd been placed in a kennel with a food aggressive dog. Her snout was grooved and scared from pushing it through the bars of her kennel in panic. She had chemical burns on her chest and tummy from someone using harsh chemicals to clean the kennels. She was suspicious of strangers, men in particular, and terrified of loud noises. Guess what? Her shelter was next to a flea market that featured nightly fireworks. She'd only had one good piece of luck: had come in with kennel cough but a sympathetic worker had managed to get her to a vet and she'd survived. “She's too damaged emotionally,” I replied. Abby began to run around the enclosure with Belle. She knew in the way dogs knew that Belle was to be trusted absolutely and was her guide back into the sunshine from the dark confusing place she'd been sent by people who had betrayed and deserted her. Belle was the best friend another dog could have. Until her untimely and unexpected death on the evening of Hurricane Katrina two years later from a misdiagnosed sarcoma, she and Abby were totally inseparable. Two halfs of a whole dog in a way. Of course, Abby's physical healing and learning took awhile. She had never lived in a house. She fell in the pool. She used the sofa table as a bridge into the unknown and toilet paper was put on earth to be unrolled and consumed. Chair and table legs fell victim to her gnawing. She ate Danny's alarm clock and cell phone and the power cord to my new laptop. One morning, I awoke to the sound of a wooden headboard banging against the wall and found her jumping happily on the guestroom bed. Each time she landed she tossed bits of mattress stuffing into the air. Belle, apparently saw nothing in these actions that needed correction. Neither did cat chasing or garbage can raiding although she taught tolerance for the Danny's elderly ferret. Abby, who is now the leader of our current three dog pack, will always fear thunderstorms and fireworks. She still finds paper towel and cardboard to be delectable delicacies. But, heck, nobody is perfect. Whatever new tricks I taught her, she taught me something too, something I hope never to forget. Given time and trust and kindness with a generous infusion of love, a damaged dog can be healed. And can heal others. What a wonderful story!!! :') Sephi was given to me when she was a pup, but Maya is a rescue. I used to work at an animal shelter years ago and my other pets (long since passed) on were rescues - Becky Ann, Huckleberry Hound, and, my cat Patra (short for Cleopatra). If you haven't heard of the Anxiety Wrap you may want to check out the site Anxietywrap.com. I got the wrap for my recent rescue who I believe was in a puppy mill and he circles. The wrap helps calm him down because it hits pressure points. It was designed, though, specifically for dogs who fear storms. One of my friends is using it for her dog and she told me about it. What a wonderful story...I'm sorry you lost Belle - it's the worst feeling in the world losing a beloved pet but I am glad you have a happy dog household! I have heard good things about Anxiety Wrap. I hope to see it this weekend at the Blogpaws Conference. Thanks for the comment Patti.